My first trip to Temagami, and the longest canoe trip of my life, and definitely worth it. I will be back to the region, but unlikely to ever duplicate this route again. Campsites stayed at: Gervais Landing, Scarecrow (island, 2 nights), Smoothwater (island), Sunnywater, Gamble (2), Jack's, Bluewater Creek (top of 200m portage, emergency site), Bill, Selkirk (north site). Gervais Road: In great condition. Went up with a minivan. Could have just been graded? Paddling: Easy, other than a few beaver dams and the low water levels. Some small parts with swift water, which was mostly waded. Water Levels: Quite low. Had greatest impact on river travel. Portages: Decently maintained, almost all easy to find, trails are used and marked. Campsites: Decent. About half had heads. Almost no benches. - Getting up the Sturgeon and Stull to get to the 1650m portage involved alot of wading and some portaging down the creek due to low water levels. We laid down a good effort on that first day. - The 1650m portage had more blowdowns than most of the other portages we saw, mostly low trippers. Definitely needs some love. - The island campsite on Scarecrow is nice, but lacks protection and firewood. - The 1000m from Whitepine to Wilderness was easily the toughest vertical portage I've ever done. Walking up the 'rock gulch' takes a few nerves. If it was wet, I am unsure if it would be passable. Totally worth it to see Sunnywater though. - There was a large blowdown on the 2700m portage out of Sunnywater, towards the end. Fell right down the path. Very rough trail partially hacked out around it. - Easily walked from the end of the 2700m portage to the start of the 330m to Gamble. The pond has receded quite far due to the low water. - Had to make an emergency site at the start of the 200m portage on Bluesucker Creek due to wet & dark conditions. Did not build a firepit. Area is up on top of large rock. - The Pilgrim to Maggie portage was not very wet, and we found it reasonable. - We also didn't find the 750m portage out of Solace to be terribly difficult. - We took the portages on the north end of the Solace lakes. Comments are: The 90m portage is not marked on either side, trail was very hard to follow. Very strange considering all the other portages in Solace were marked and good. Also, the 53m portage into Selkirk is probably only that length in the spring. Required a 150m+ extension to the north on the Selkirk side due to low water. Extension was clearly visible, but not marked except for flagging tape on the lake exit. - 1275m portage to Ghoul Lake was reasonably wet. And one more thing - below is a picture of either a lynx or bobcat we captured on the east shore of Jack's lake, about 150m north of the campsite. It was towards the later part of the afternoon, we might not have even seen him except we were staring to the left looking for the campsite. Can anyone positively identify this guy? I've never seen a wildcat, they are usually so elusive. Much too far north to be a bobcat. That would make it a lynx assuming it has sharp ear-tufts and a short stubby tail. I guess it's a lynx, although (to me at least) the face doesn't look quite right... but if it had the stubby tail then it's a lynx for sure. White Pine to Wilderness, ahh yes - I remember it well. Portaging up a cascading rivulet in the rain with 100lbs on my back. Some carrys you do not forget. Nice route, I hope you enjoyed the experience. I thought the same thing originally, that it must be a lynx due to the northern location, but check out the map below (sourced from Wikipedia). 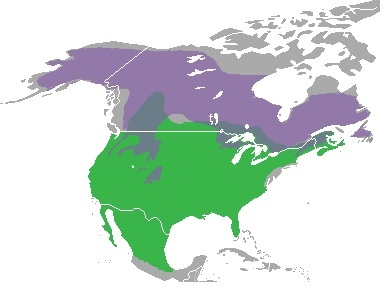 Green represents the range of the bobcat, and Purple the lynx. It appears that Temagami is in an area where the ranges overlap. 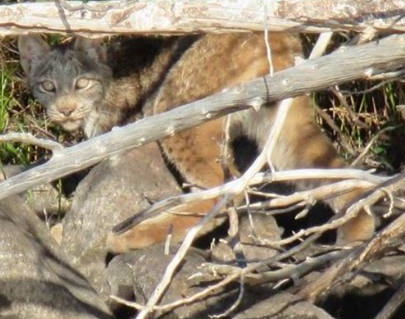 Also, apparently there are bobcat/lynx hybrids in the wild. That why I am somewhat uncertain. Interesting... I'm basing what I said about ranges on fairly old information, i.e. an Algonquin Park publication from the 80's which says the northern limit of bobcats is roughly around the southern boundary of the Park. I do think the face looks somewhat cougar-like but it would need to have a long tail. Just for interest here's a picture I took last fall on the North Magnetawan R. east of Sundridge. Definitely a cat track, besides which we heard it at night making a very loud sort of squalling sound. 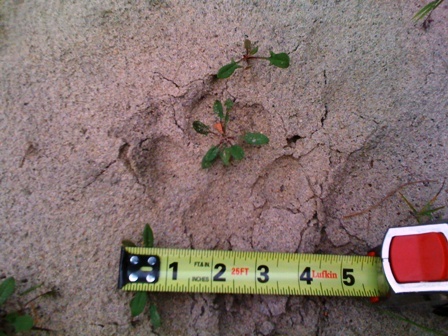 The track is 4 inches wide which works for either lynx or cougar but obviously we're assuming it was a lynx. Seriously, grncnu? You go camping with a tape measure? That is awesome! For measuring record size fish, I take it! You caught a pic of wildlife at it's finest mcon99! We did pretty much the same trip this past summer! Some good times I wrote a blog about it that you might find interesting (WatermarkWords.org) Temagami is beatiful, glad you enjoyed it!